Switching careers takes courage. And veterans know a thing or two about courage. But when military personnel finish serving their country and look to re-enter civilian life, they need more than just strong nerves to make the transition to a new career. Finding a job demands practical strategies. For veterans, the struggle is often aligning the skills and experiences they’ve gained in the military with the types of jobs that exist outside the military. On top of that, long-serving veterans don’t have a lot of experience with resume making. Not to worry. This post is all about helping those that have served in the armed forces create resumes as they seek out civilian positions. Keep in mind that there are plenty of other considerations when making a resume. So be sure to also see our guide on how to build a resume in 2018. There are three different resume formats that are typically used for resumes. For veterans, the most suitable choice is what is called a “functional” or “skills-based” resume format. Why this? Well the logic behind the functional format is that it gives greater attention to the skills a person has developed. This stands in contrast to the “reverse chronological” resume format, which offers more space for a person to outline a long employment history in order to demonstrate career progression. Many veterans have spent much of their working life in the military, so their employment history is really one employer – even if they have progressed through different roles or ranks. That being the case, listing all the positions and responsibilities over a military career often isn’t the best strategy for persuading recruiters in the public or private sector. This is because recruiters often aren’t familiar with the types of work military personnel undertake, and therefore may not see the applicability of military experience. To avoid this problem, veterans should focus less on describing their former roles/responsibilities, and instead focus on highlighting the skills they have gained that are directly relevant to the position they are seeking. Since veterans should embrace the functional, skills-based resume format, the most critical resume section for them is the “Key Skills” section. This section should come right after the resume summary and should contain the bulk of the content of the resume. The skills section is where you will get descriptive about those skills that are most relevant to the position for which you are applying (more on this below). But you can also have an “Additional Skills” section that provides a shorter list of the skills you possess, without getting into a more extended description for each listed item. You should still have a “Work Experience” and “Education” section on your resume, but these don’t have to be very descriptive. 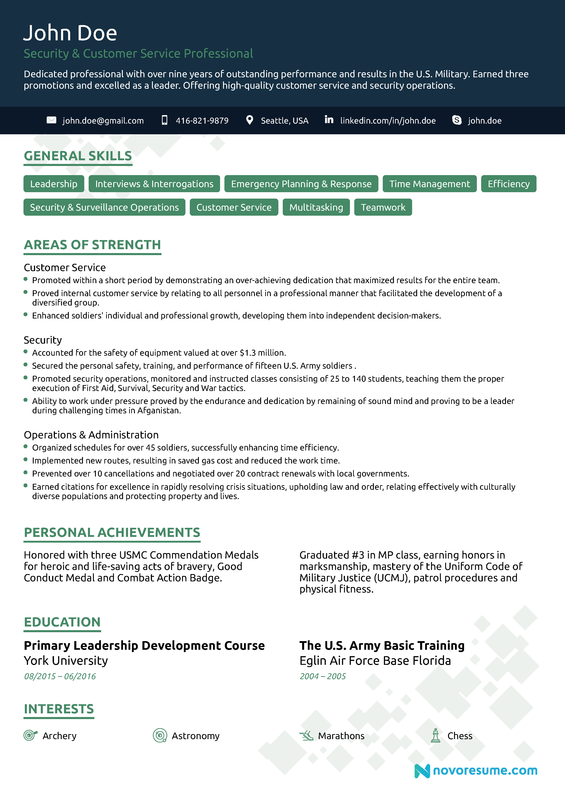 Also, it’s quite common for veterans to have a list of accomplishments, certifications, and courses completed, which may be valuable in recruiters eyes depending on the prospective position. You can include sections for these elements on your resume, and a good resume builder will make it easy to do just that. In terms of the skills to emphasize, it’s critical that ex-military personnel take a close look at the position requirements to see which skills the organization values most. Then, based on these needs, veterans can tailor the skills section of their resume to demonstrate that they have these skills. This is something that recruiters absolutely want to see on a resume. Keep in mind that with a skills-based resume, it is not enough to just state that you have a specific skill. You need to provide some proof, preferably with an example of how you have applied that skill in your military career. Here’s an example of how someone who served in the armed forces might include “Leadership” on his/her resume. Leadership: Served as (insert ranking) where I directly led and oversaw a team of (insert # of people) officers responsible for telecommunications support for military operations in (insert place) taking place over (insert time period). Note that this example tries to provide as many specifics as possible. Make this your goal when describing your skill set. Not sure of what types of skills can go on a resume? You’d be surprised at the array of hard and soft skills you can include. Take a look at some of the best skills to add to a resume. Some of the most common skills for veterans to highlight in their job applications include leadership, attention to detail, teamwork, problem-solving, planning, communication, and many more. But again, the key is to focus on those skills that seem most relevant to the role you are after. Here are just a few elements that veterans need to be cautious about when creating their resumes, as well as a few useful counter-strategies. Avoid military jargon – Assume that the person who reads your resume has almost no knowledge of military terms, including acronyms or commonly-used code names. Find ways to describe jargon with everyday language. Do not include irrelevant skills – Your resume is a strategic document meant to persuade your reader (a recruiter) that you are qualified to do a job. So, even if you are proud of certain skills, if they have little relevance to the role, don’t give them too much emphasis. Resist the urge to include an “Objective” – including a statement of objective on a resume has gone out of style. In the past, it was used particularly by career-switchers to explain why they wanted jobs in new fields. This may seem applicable to veterans looking for work outside the military, but there are better ways to address this topic – for example, in your cover letter. Regarding the last point, veterans should see job applications as a total package that includes both a cover letter and resume. Your cover letter will give you ample space to expand on your motivations for applying for a civilian-based job and how the skills and experiences gained while serving can be transferred to a new career. Rest assured, many recruiters already see tremendous value in the skill sets that veterans can bring to their own teams and workplaces. Your mission is to show them why you are the right person for the job. Follow the advice provided above, and you’ll be well on your way. And don’t forget the importance of how your resume looks. Take advantage of a resume builder to give your resume visual appeal that recruiters can’t ignore.